New pizza place in Manchester? Oh yes please, let me just call up my pizza-loving sister and we’ll be there, don’t you worry. Enzo has had a successful run from its base in Nantwich and there was a lot of hype online when the news spread that they were looking into opening a city centre restaurant. Sure enough they followed through with their plan and last week we called in for the launch evening. Traffic had been an absolute nightmare, so the minute I flung my car into a space, I ran to secure my seat at the new Fountain Street pizzeria. Walking in a bit flustered from my run, I was greeted with smiles and was offered a nice cool drink as I chose a perfect, people-watching window spot. A few moments later, a wonderful waitress came round with a plate of marathon peanut butter bars, cut into bitesize pieces ready for tasting. Not a great lover of chocolate, but hungry and with still no sign of my guest, I decided to try one as a tummy teaser. So much nicer than I was expecting! In fact so nice I needed another when she passed by again. I had my eye on that plate for an apres-pizza treat. It wasn’t long before my sister showed up and we were ready to try a selection of the menu and see how Enzo had managed to establish itself in the competitive world of pizza making. When I ran past earlier, I thought it was quite strange that they were so close to Pizza Hut, setting themselves not just on the same street but literally a few feet away from an established brand selling the same product, very strange no? As the pizzas started to be brought round I realised that they may both be selling pizza, but that’s about the only similarity. 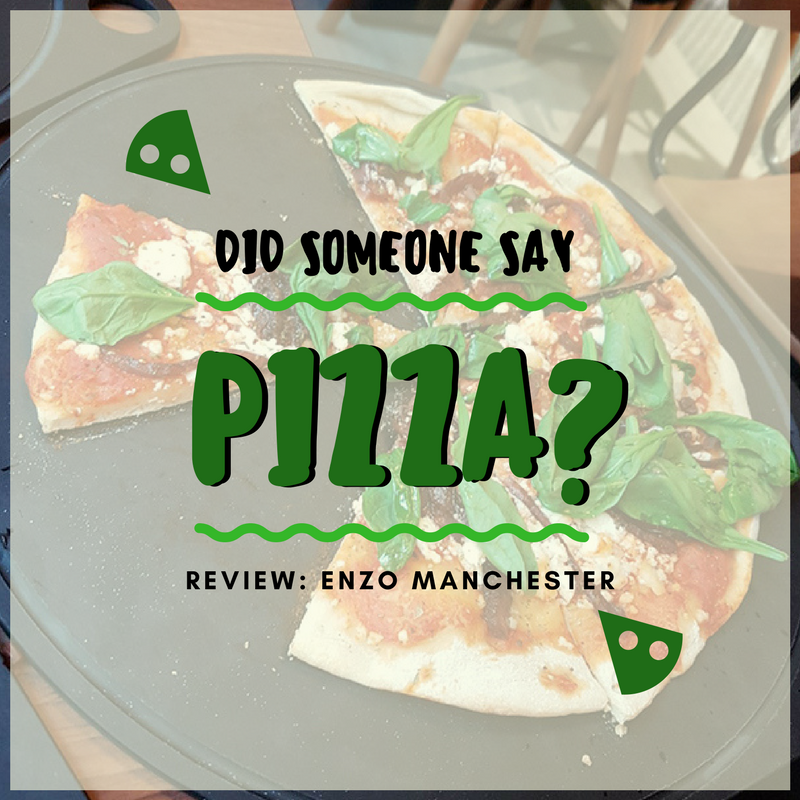 There’s no deep pan here at Enzo, all the dough is prepared fresh on site daily and it’s very much all about the authentic crispy, Italian-style pizzas, offering a variety of unusual – well thought out – toppings. As the meat wasn’t halal, they made sure to pass round a selection of vegetarian options for us, including some that were vegan friendly. Vegan cheese isn’t one of my favourite things on earth, but it wasn’t bad, and my un-enthusiasm is linked more to personal preference rather than taste. The pesto pizza with feta was a real treat, as well as the buffalo mozzarella. With all these delicious varieties being showcased, I grabbed at the menu wandering where they planned on fitting themselves in price wise. Nice surprise, the prices of even the fanciest sounding pizzas were very reasonable. Before heading off we were also treated to a couple of pasta dishes to try out, just like the dough all pasta is homemade, fresh on site! Now thats impressive. The energy at Enzo was really refreshing. They look like an established franchise-style restaurant, but the service and grounding of the company is very much that of a family-run independent, where the focus is on keeping things fresh, wholesome, ensuring there is real taste and passion in everything they do and serve. Nice to see such a place in the middle of the big City. It’s a feat making the journey into a high profile city centre location, for anyone, but more so for restaurants. The food scene in Manchester has definitely taken off over the last few years, with seriously stiff competition. Hopefully Enzo will continue doing what they do best, focusing on keeping the food ‘real’ and the atmosphere positive. I look forward to seeing them stay on for the long haul! !